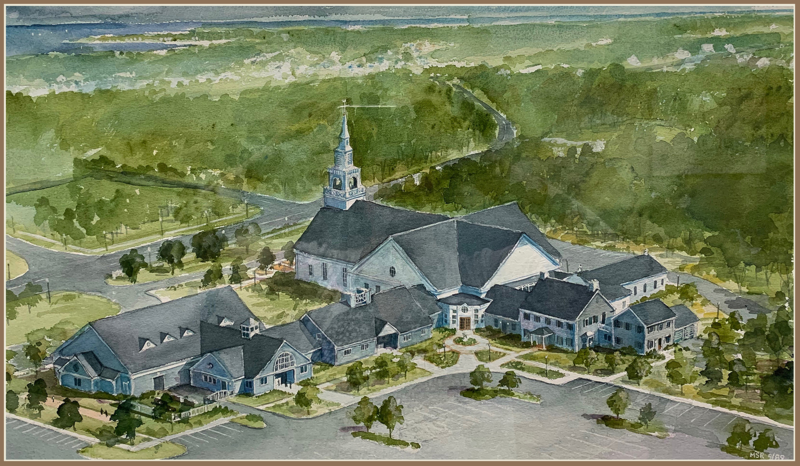 The Parish of Christ the King, created from sections of our Lady of Assumption Parish in Osterville was established in 1984. Rev. Msgr. Ronald A. Tosti was appointed as the first pastor charged with organizing the faith community and constructing the church and parish complex; he served the parish for 22 years until his retirement in 2006. Rev. Msgr. Daniel F. Hoye succeeded Msgr. Tosti and served the parish for 10 years until his retirement in 2016. Our present pastor is Fr. Edward Healey. The Parish officially covers the entire town of Mashpee and the Villages of Cotuit and Marstons Mills but draws members and visitors from throughout the upper Cape. The extensive present parish complex was completed in 1989 and was dedicated on the Feast of Christ the King in that year. The Federal Style Church seats 1000 people and the complex also includes St. Jude’s Chapel moved from its original location on Route 28 in Cotuit which accommodates 85 worshippers. We also have a large parish hall and Faith Formation Center that hosts many activities for the parish and community at large including many self-help groups. Located on a knoll overlooking Mashpee Common, the nearly eight-acre site has a number of gardens, playground as well as a picnic and recreation area for visitors to enjoy. Designed originally by the firm of Holmes and Edwards, the interior of the Church was fully renovated in 2011 by the Palanza Design of Mansfield, MA.